The Event: ‘Go Green Bangalore’ – A Cycle Rally in Bangalore on Sunday, 7th March 2010, 6.30 am. The Task: Cycling 21 kms : Kanteerva Stadium – Hebbal Flyover – Kanteerva Stadium. · To commemorate International Women’s Day. · To tell Bangalore that it is time to Go Green and Healthy. · To urge the Government to create cycling and walking lanes around the city. Participation: Anyone and everyone who believes in cleaner and greener Bangalore. Beg, borrow, buy a cycle and be at Kanteerva Stadium. Email us and we will send you the application form. Conducted by: Women Adventure Network of India (WANI), this event is being held in Bangalore, Nagpur, Jamshedpur, Mount Abu, Baroda and Surat. Imagine Bangalore as a city where it is pleasant and safe to walk to shops, parks, schools, or work. Where streets are safe to cycle on; for children, senior citizens and the physically challenged to cross. Where your work place is easily reachable by bus or rail. Where it is safe to bicycle or walk to the nearest metro station or bus stop. Where buses move quickly in bus lanes and get priority at traffic signals. Where you do not have to shout over traffic noise to have a conversation, and are not suffocated by traffic fumes at congested streets. The key to realising this vision is Sustainable Transport. Join us at the city’s first sustainable transportation Unconference! At MobiliCity, a diverse group of citizens and experts will engage in open dialogue, share ideas, and propose forward-looking strategies and solutions for accessible, equitable, efficient and environmentally sustainable transportation in Bangalore. Mobilicity is co-hosted by Praja and CiSTUP. To know more about Mobilicity, go to mobilicity.praja.in. I was sitting in my car at a traffic light the other day and happened to look upwards. What a beautiful sight I thought to myself. The branches of the tree grew outward, with its leaves covering nearly the whole road extending till the other side providing shade from the sun to me and other commuters on 2 wheelers, cycles and other forms of transport. For a moment, I just stared upwards at the cover of leaves feeling lucky that we still have that in Bangalore. But for how long? We’ve all seen how many trees are getting felled. How the Metro has destroyed some of our best roads. But we’ve got to make efforts, we have to do everything possible to retain our green cover, plant more trees, start thinking in a more eco-friendly manner. It’s heart-warming to see people cycle to work nowadays – all geared up with their helmets and face masks – what a great step it is towards de-clogging our roads. It’s one less person in a car. Imagine, if even a few thousand of us got onto bikes and cycled to work, what a change this city can see! I tried cycling to office myself one day to see if I could manage the traffic. And yes – it was bad – but I made a start. Now, at least I know I can do it. And I don’t think it’s that big a deal once you start. Yes, there’s traffic. But you’re being a part of the solution, not the problem when you start looking at eco-friendly ways of commuting instead of the fuel guzzling alternatives. Try it out sometime – maybe once or twice a week. It’s worth it. You’ll realise that a 10km distance on a cycle is actually not much at all. And besides you’ll have the intense satisfaction that you’re doing your bit towards making Bangalore traffic more bearable. Many people say they “can’t” do it, that they can’t handle the traffic. But I don’t believe this is true – anything is possible – you just need to start. Even in our vehicles we have to battle traffic. It’s the same thing on a cycle, except that you’re on 2 wheels and it’s actually sometimes easier! I went from not knowing how to cycle (last year) to slowly making my way around on cycle in Bangalore and hopefully will be more confident in traffic in a couple of months. It’s an effort but it’s definitely worth taking! Here’s an initiative that believes in “Doing good while doing well“. Net Impact is an international nonprofit organization whose mission is to inspire, educate, and equip individuals to use the power of business to create a more socially and environmentally sustainable world. Who : You, me and every Bengaluru resident. And not just the 17th, let’s sustain this everyday! 1. Bengaluru’s population is about 8 million. 2. Bengaluru is considered to have the highest density of traffic in the world. 3. Traffic population is doubling every 5 years.4. Road space used by a person in a bus is 3% of a person in a car and 5% of a person in 2 wheeler. 5. Air Quality Index (AQI) is between 150-300 in different areas of Bengaluru. AQI>100 is severe air pollution. 6. Bengaluru has the highest number of 2-wheelers in the world. The people of Bangalore deeply mourn the sad demise of our life giving trees, which lost their lives due to our callousness. We will be performing a , ”Shraddha” ceremony for them, on Sunday 24th May at 11am. Please join us to pray for the departed souls. Orange or Blue, which one for you!! 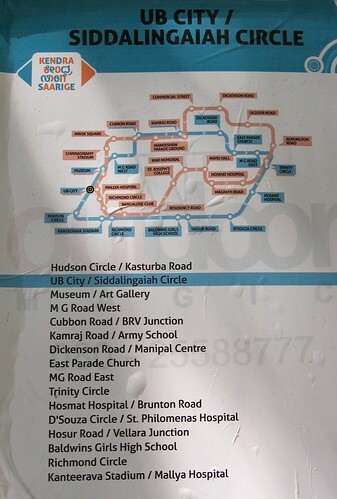 The central business district is encircled b y these new HOHO (Hop on Hop off) bus routes, I manage to stand in front of one HOHO point near UB city and took this map for all….haven’t’ you tried hopping on one! !